The wide publicity which the press in different sections of the country has given to my offer to show workingpeople earning a dollar and a half, or less, per day, how to get a good dinner for fifteen cents, has brought me a great many letters from those who earn more, and can consequently afford a more extended diet. In response to their requirements I have written this book, which I hope will be found servicable in that middle department of cookery it is designed to occupy, where we begin to look for more than the absolute necessaries of life; it is a practical guide to the economical, healthful, and palatable preparation of food, and will serve to show that it is possible to live well upon a very moderate income. 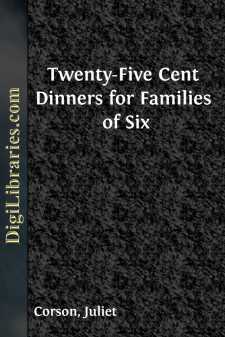 It is necessary to repeat in this book some of the directions given in the work on "FIFTEEN CENT DINNERS;" but I hope their reappearance will be pardoned on the ground of their usefulness, and also because the first book will fail to reach many for whom this one is intended. Good food, properly cooked, gives us good blood, sound bones, healthy brains, strong nerves, and firm flesh, to say nothing of good tempers and kind hearts. These are surely worth a little trouble to secure. The first food of nearly all living creatures is milk, the only entire natural food; that is, the only food upon which health and strength can be sustained for any length of time, without using any other nourishment. For this reason it is the best food you can give the children if you must restrict their diet at all; and it is also a valuable addition to the food of grown persons. While this fact about milk is settled, it is generally acknowledged by people who study the subject that we thrive best on a variety. We get warmth and strength from fat meat, wheat, rye, barley, rice, milk, sugar, fruit, peas, beans, lentils, macaroni, and the roots of vegetables; we gain flesh from lean meat, unbolted flour, oatmeal, eggs, cheese, and green vegetables; and, if we want to think clearly, we must use fish, poultry, the different grains, and a good variety of fruit and vegetables.